As Marion County’s preferred cleaning company, we work to ensure the complete cleanliness of your home through services that remove the grime from the most-overlooked areas: air ducts and dryer vents. Though relatively unseen by the residents of a home, in-depth air duct and dryer vent cleaning services help to ensure the safety and cleanliness of the rest of your home. Dirty air vents are attributed to the exacerbation of allergy and asthma symptoms and, according to the Environmental Protection Agency, can cause respiratory ailments in seniors, children and people with suppressed immune systems. Because these health problems can be long-lasting and fairly costly, we recommend thorough cleaning of air ducts be performed approximately every two to three years. Though many experts advise longer periods of time, we believe that the environmental circumstances of our region justify our timeline. The addition of pets or children in the home can also change this timeline. Clogged, dirty dryer vents present a fire hazard that many homeowners choose to overlook. According to the US Fire Administration, more than 2,900 fires a year occur in home clothes dryers, causing an estimated $35 million in damages and an average of five deaths each year. The leading cause of these fires is the failure to keep them clean. Depending on the number of people in a single household, it is recommended that clothes dryers that perform the average amount of loads be cleaned at least once a year. A family of four may want to consider getting the vent cleared twice a year, if not more. Remove the potential for fire by having all lint and debris eliminated by the professionals in dryer vent cleaning*. – Includes homes with a crawlspace or basement area and a first-floor laundry room. – Performed within homes on a concrete slab, with no access to underground venting from the first-floor laundry room. 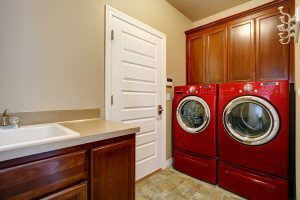 – For homes that feature a second-floor laundry room.